Researchers from the Universities of Helsinki, Turku and Missouri as well as the Family Federation of Finland present the first results of a new, extraordinarily comprehensive population-wide dataset that details the lives of over 160,000 World War II evacuees in terms of integration. The results demonstrate that migrants' integration into a host community involves a trade-off between gaining increased social status and having fewer children. 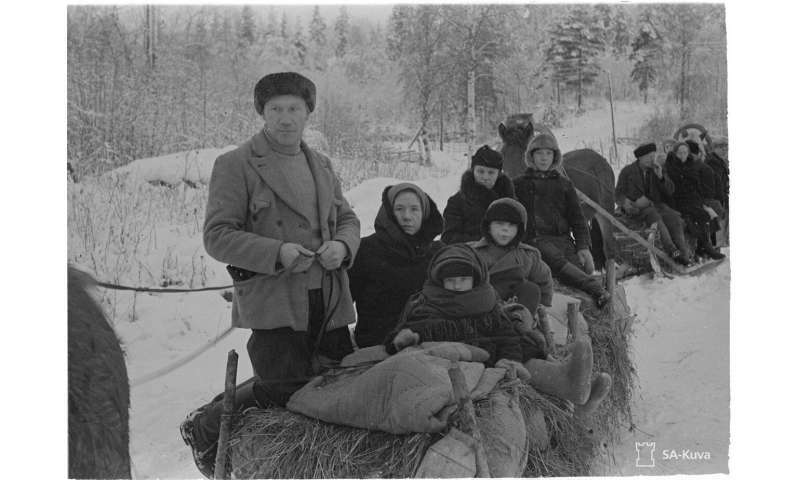 Evacuees from Karelia, a region ceded by Finland to the Soviet Union during World War II, had the unfortunate fate of having to evacuate from their homes twice in the space of a few years. Evacuees fled to western Finland at the beginning of the war, but then many of them returned to their homes for two to three years when the territory was recaptured by Finland, only to have to evacuate again at the end of the war. "This exceptional historical event provides a natural experiment that allowed us to analyse the likelihood of various social groups returning to their natal communities when offered the opportunity," explains Robert Lynch, the first author of the article from the University of Turku, Finland. Evacuees who returned to their homes after initial evacuation had more children after the war than those evacuees who stayed in western Finland for the entire war. It appears that the stronger bond to their natal community and the social and familial ties that come with it had a positive effect on fertility. However, after their second evacuation, they were less likely to integrate and intermarry with people in western Finland, consequently missing out on opportunities to increase their social status. The study is published in Nature Human Behaviour.